The man responsible for the slaughter of a wild sleeping lion has been identified online after footage of the trophy hunt resurfaced. His name is Guy Gorney, he’s 64, and he lives in Manhattan, Illinois, but spends a proportion of his spare time trophy hunting. Footage from one such outing in Zimbabwe has recently gone viral, after the Twitter account @Protect_Wldlife reposted the clip, believed to have been filmed in 2011. 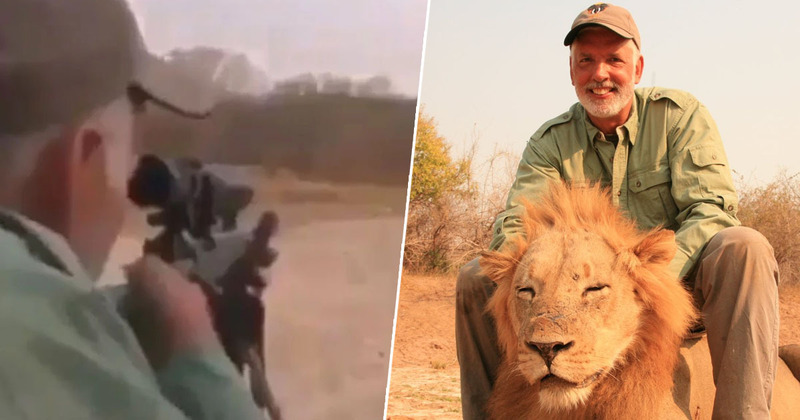 The video shows Gorney pointing a rifle at a sleeping lion while he’s being coached to shoot using wild animals as targets. He fires one shot, which wakes the lion up, who arches its back in pain and looks around to find the source of the shot. The hunter then fires a second and third shot, and the individual guiding Gorney tells him to stop. The voice can be heard saying, ‘Okay, okay, don’t do any more’ before congratulating Gorney on killing ‘a very nice lion’. Several Twitter users who observed the resurfaced footage called out the cowardice of the trophy hunter, particularly as he attacked a wild animal at rest. Gorney has been an outspoken advocate for trophy hunting. Since his identification, his public Facebook profile has been inundated by animal lovers who have dubbed him ‘pathetic’, ‘weak’ and called his actions ‘vile’. In an interview from 2015 with CBS, Gorney showed no remorse for his ‘hunting’ habit, which at that time included killing 70 big game animals, such as elephant, lion, leopard, rhino and buffalo. I have a hard time understanding, if you have a picture of somebody with a deer, nobody seems to care. But if it’s an elephant, it’s a big problem. If it’s a lion – especially now – it’s a huge problem. But to me, either way, I’ve stopped a beating heart. I like pitting myself against these animals. And what greater trophy than an elephant? The tweet that unearthed the old footage cites statistics according to the African Wildlife Foundation which estimates, at the current rate of lion hunting and poaching, the majestic animals could go extinct by the year 2050. Speaking to CBS, Gorney said he abides by the law when he hunts and differentiates his trophy hunting practice from poaching, adding he doesn’t understand people who threaten other people. While poaching is illegal in Zimbabwe, hunting is permitted for those who gain permits to hunt in areas and times regulated by Zimbabwe Parks and Wildlife Management Authority. UNILAD has contact Gorney for comment.